Defense Contractor To Head Trump Intel Advisory Board - Joe.My.God. 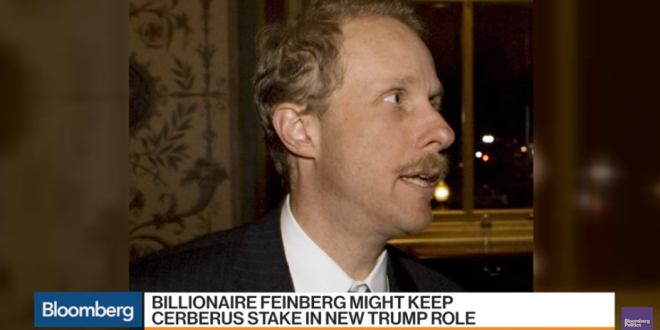 Stephen Feinberg, a billionaire financier, will head President Donald Trump’s Intelligence Advisory Board, the White House announced on Friday. Feinberg is the co-founder, executive chairman and co-chief executive officer of Cerberus Capital Management, an investment firm that also owns defense contractor DynCorp International. Shortly after taking office in 2017, the president reportedly asked Feinberg — a Trump supporter and major Republican donor — to conduct a review of U.S. intelligence agencies. Feinberg, however, had not been cleared by the Office of Government Ethics at the time and his status was still unknown as of Friday evening. The White House did not immediately respond to a request for comment.